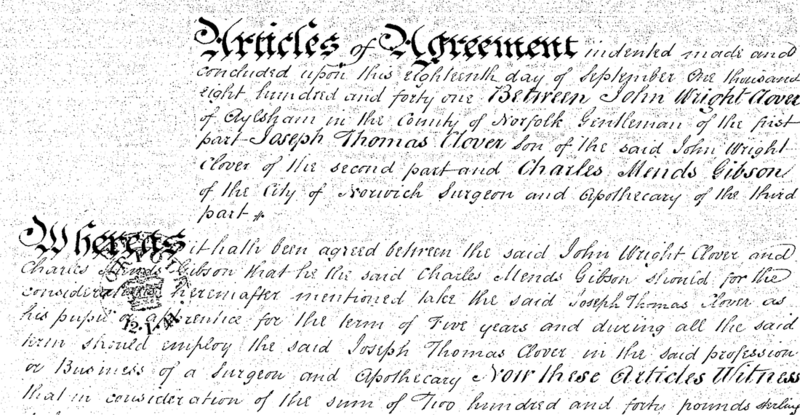 At the age of 16, Joseph was apprenticed to Charles Mends Gibson in Norfolk, Some details of the Articles of Agreement are illustrated below. John Wright Clover agreed to pay paid £240 in three annual instalments of £80.00 to secure a five year apprenticeship. For this Joseph would be fed "sufficient meat and drink suitable to his station in life" and housed in "...comfortable and convenient lodging in the Dwelling house of the said Charles Mends Gibson". Because Gibson did not have an appointment at the Norfolk and Norwich Hospital, Joseph was separately attached to surgeons there as a dresser and records attendance at operations there prior to this apprenticeship agreement. He attended many operations which he faithfully recorded in his papers from 1841-1845. All of these operations were conducted without anaesthesia or antiseptics.